Growing up I loved Heath bars. One summer I think I slurped down my weight in Heath Bar Blizzards, horrible dairy intolerance reactions and all. It was worth it. But since I don’t plan to raid Dairy Queen for a Heath Bar Blizzard anytime soon, and because I love cookie dough, I came up with today’s recipe which satisfied my toffee cravings. I think it will do the same for you. C’mon, cookie dough, chocolate and toffee. What’s not to love? 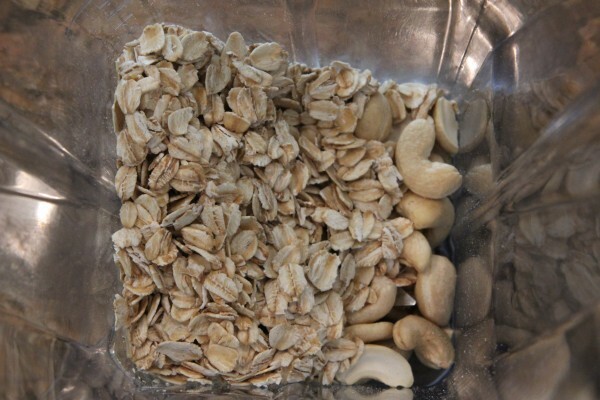 First add cashews and oats to Vita-Mix or food processor and grind into a fine powder. Then, add the agave and vanilla extract and blend again. Finally, add the chocolate chips and toffee bits and either stir in by hand or barely blend/pulse until incorporated. Retain some texture. 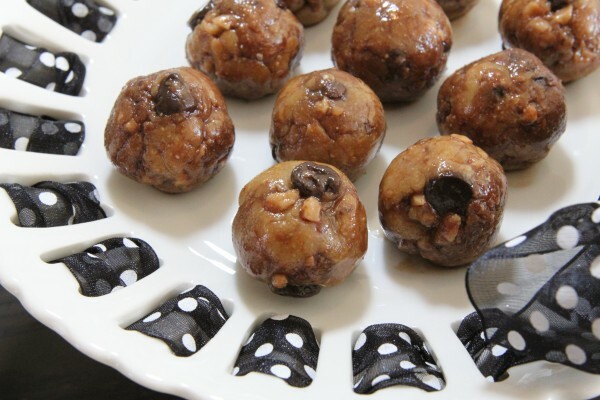 Remove the dough and form into cookie bites. 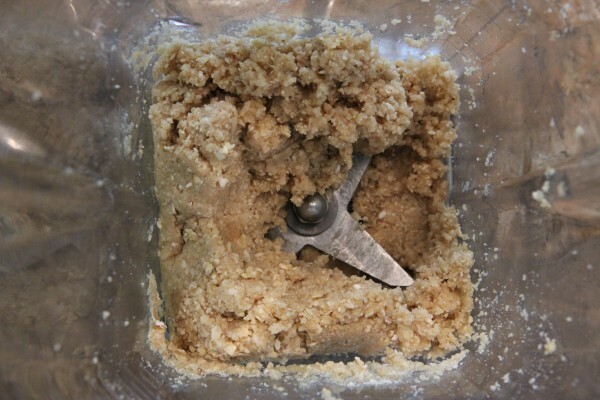 If dough is soft or hard to work with, refrigerate/freeze for 20 minutes prior to forming into bites. 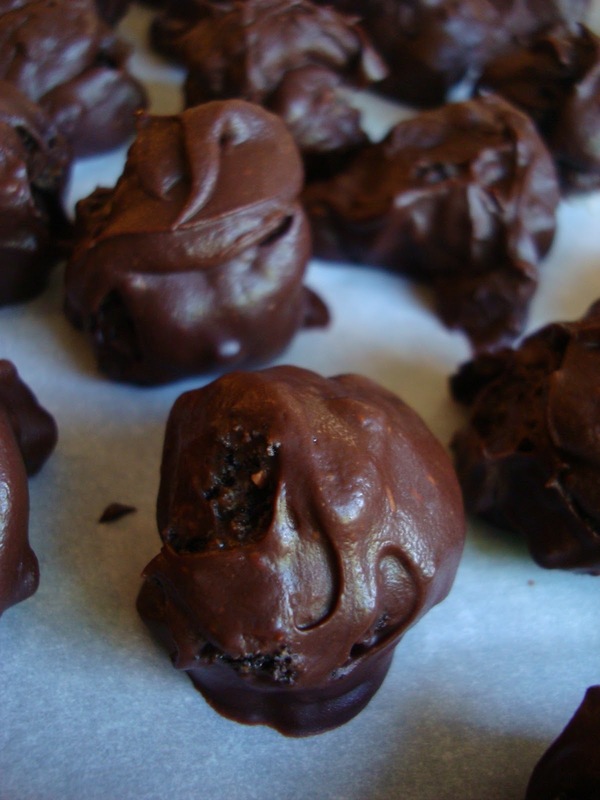 After the bites are formed, drizzle them with dark or white chocolate by melting 1/4 c dark/white chocolate. With a spoon, drizzle chocolate over the top of the bites (see here for an example) Or, dip each bite entirely into chocolate. 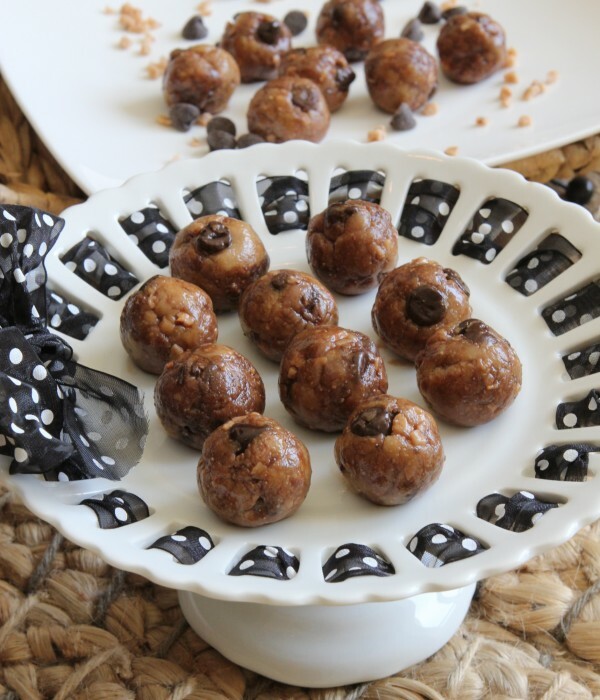 Dust finished bites with cocoa or carob powder. 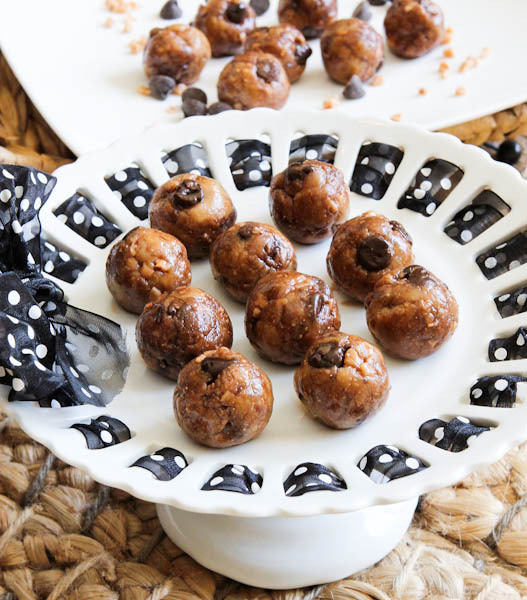 Add dried coconut flakes to each ball by rolling them in coconut at the end, or adding 1/4 c dried coconut to the dough. Increase agave/maple slightly if dough is too dry. Store the dough bites in refrigerator or freezer. 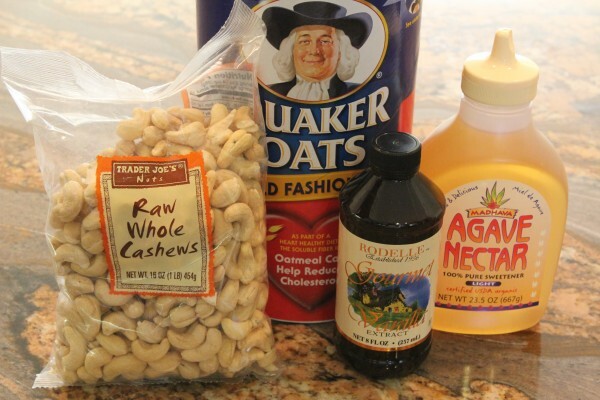 Add agave/maple and vanilla extract to the cashew/oat powder and blend again. Dough. You will know when your dough is the right consistency because it just looks like it’s going to stick together without being too wet or too crumbly. 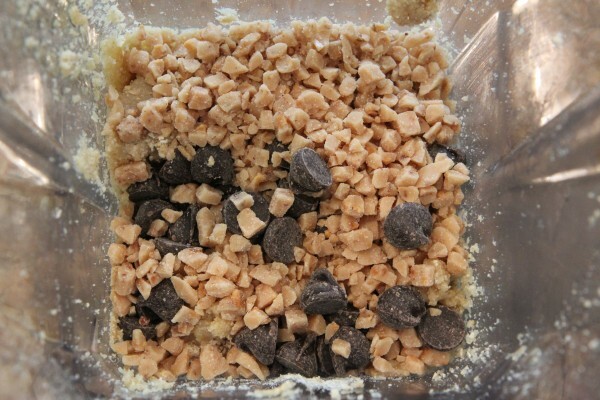 Add Chocolate Chips + Toffee Bits and do a light and quick blend or hand stir. Don’t pulverize the goodies. 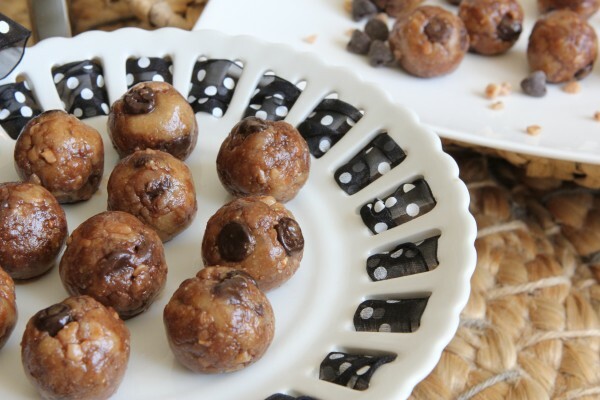 The little crunchy toffee bits combined with the dark chocolate chips are perfect in the chewy, raw, doughy bites. 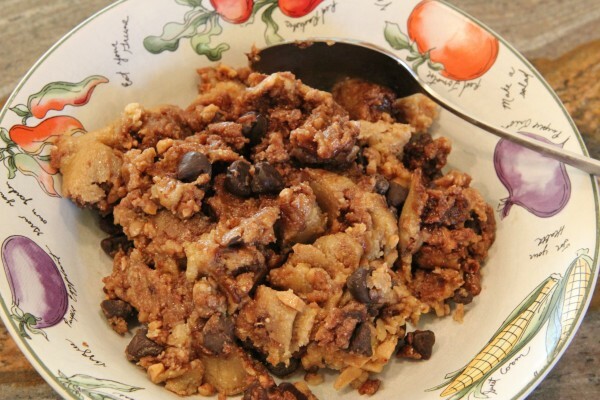 When is cookie dough ever a bad thing? 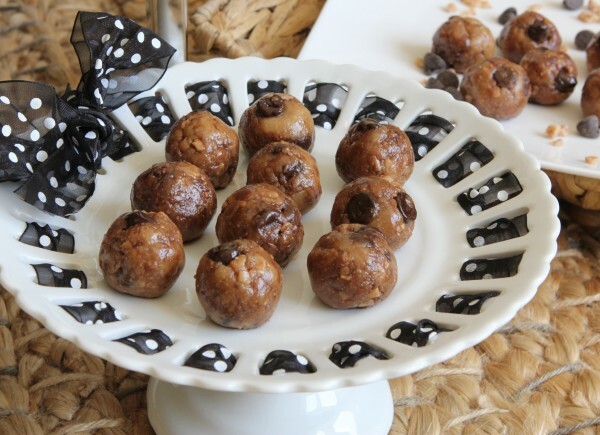 And there’s also my Dessert Balls & Bites Post Showing about 20 of my Balls & Bites Recipes from Raw Vegan Donut Holes to Chocolate Covered Oreo Balls. Including my original Raw Vegan Chocolate Chip Cookie Dough from over 18 months ago, which is where today’s recipe was derived from. From my last post about Sandwiches & ‘Shrooms, as predicted mushrooms are a love ’em or hate ’em food. But I was surprised to hear how many of you really love your shrooms! And glad you liked my creative twist on “bread” sandwiches. Gotta think outside of the gluten box. 1. Best thing you ate or did over the weekend? 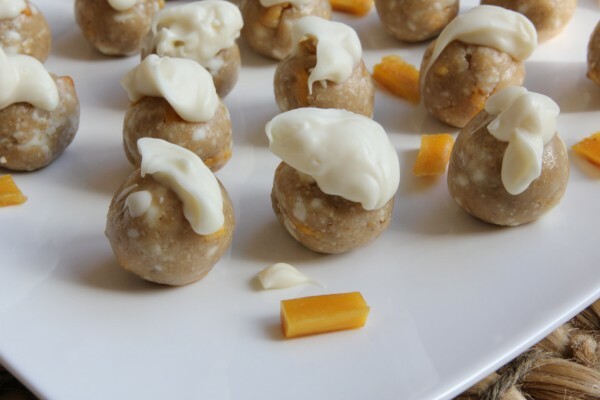 These Toffee Cookie Dough Bites rank right up there but I got together with a friend and it was great. Stay tuned. 2. 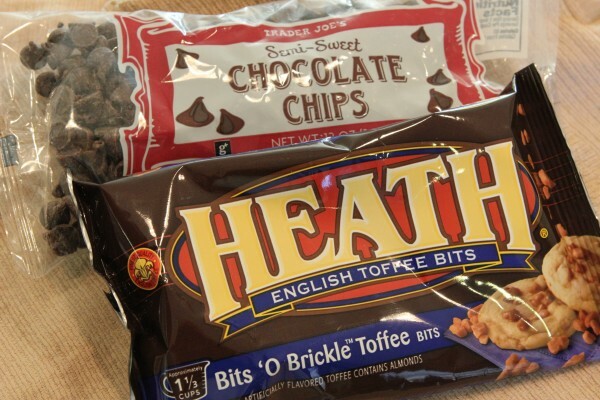 Do you like Heath Bars or Toffee? 3. Favorite mainstream candy bar? If you rattle off some favorites, I can put them into dessert recipes. 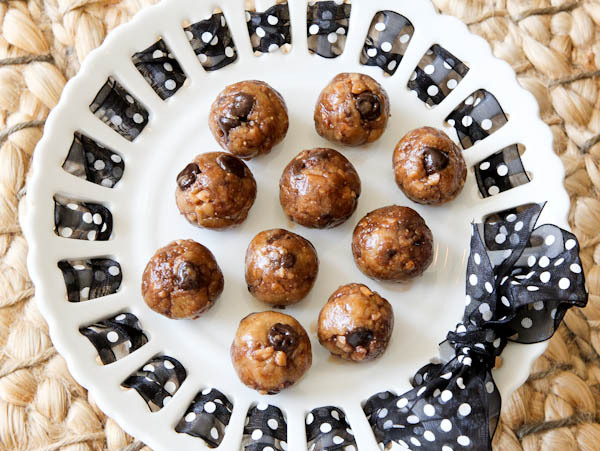 Not necessarily just into raw dough bites, but into other cooked recipes like brownies or cookies, too. I am thinking Butterfingers, Snickers, Mounds Bars, Laffy Taffy even. What should I try next? Oh yeah, I remember Blizzards – thank goodness I was to young to care about the calories in them! 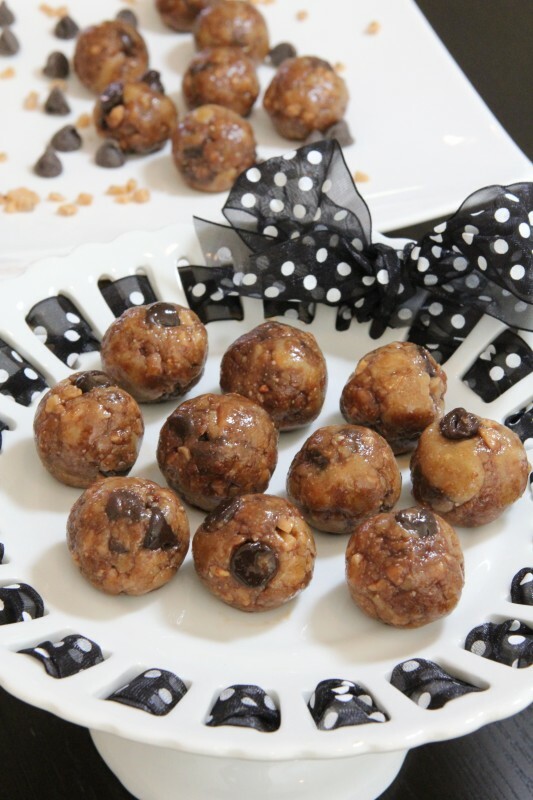 The Toffee & Chocolate Chip Cookie Dough Bites look divine, awesome job and thanks for the recipe! Great pics with the new dishes. 1. Not too much with yucky weather, saw a movie and went to the mall. 2. Yes, love the crunchy sweet texture. 3. Reese or anything with nut butters and dark chocolate. Or dark chocolate and mint. Your desserts look amazing! Are the toffee crumbles, Heath, suitable for vegans?? 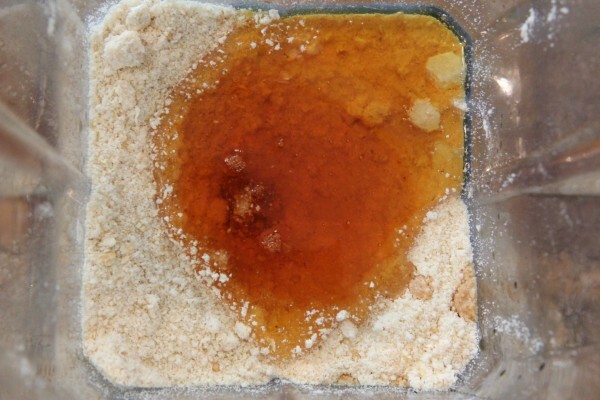 toffee is just sugar and butter boiled and hardened; you can skip the butter and use fake butter but if you boil it all, you will create toffee. you can then add it to a recipe if not having the trace amount of dairy is something you don’t want. Holy doughballs…I think I love you!!! These look so fetching good!!!!! Yumm I love toffee! These sound so delicious! 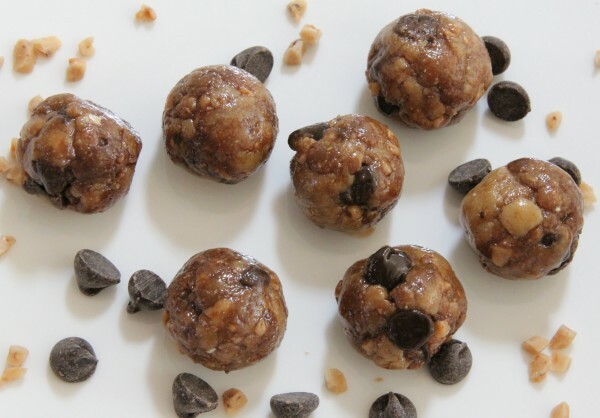 I’ve never heard of a heath bar… but those dough bites look to die for! I am such a dork. I made some vegan toffee this morning specifically to have on hand to make these bites later in the week. In heavy bottomed pan, I combined equal parts sugar and Earth Balance. Heated and stirred often over medium heat. When it hits 285 degrees, it’s ready (used my kitchen thermometer to check). If you don’t have a kitchen therm, just look for it to hit toffee color, or maybe slightly lighter to account for carryover cooking. 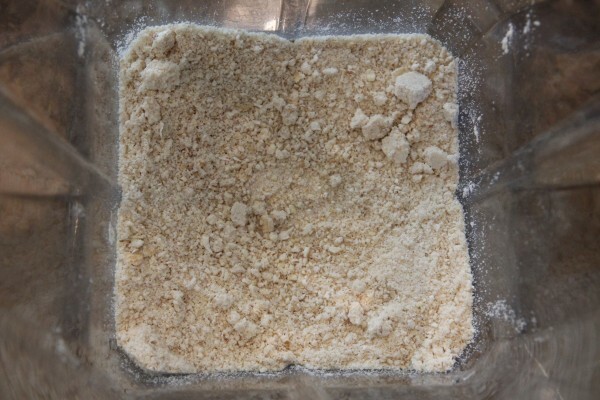 Pour it onto a cookie sheet lined with parchment, let it sit and cool. It was my first time making toffee of any kind, and it looks and tastes great. Don’t miss the dairy one bit. If you want soft toffee, breaking out a candy thermometer and being much more precise is required. But for baking purposes, making it isn’t too bad. The dishes are awful though! Rock hard sugar everywhere stuck onto everything! Yeah, the dishes could be bad. Thank goodness for parchment, and I washed up everything else immediately, which def helped. I LOOOVE toffee but haven’t really thought of it in a loooong while since really changing up my diet! But these little babies look soooo good, I just might have to make them soon. Thanks for the great recipe and idea! I will say that my favorite mainstream candy bar is snickers. All the caramely, peanuty, chocolaty goodness. But staying on a healthy side of my need for sweets, your recipes have defintely given me the satisfaction that I need! Oooh that plate you used is SOOOO cute!!! I am seriously hungry now! do you have to use quaker oats, or will normal porridge oats do? These look absolutely delicious! I love toffee, but never thought about incorporating it in this way. 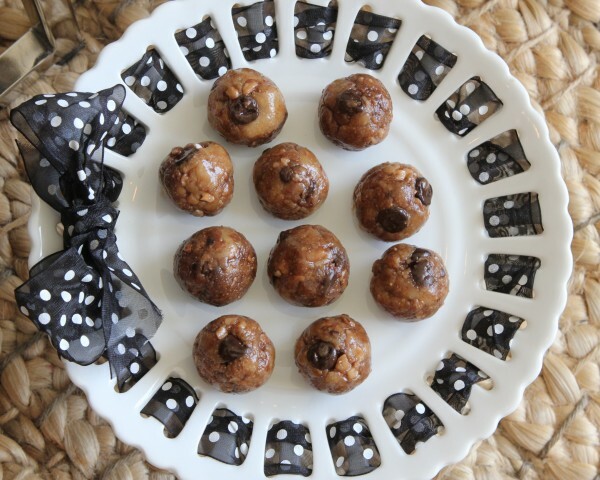 All of your cookie dough balls look so yummy. I can’t wait to try. These look incredible and that plate with the ribbon is TOO cute!